It has been a VERY long time since I have written anything on here! Almost 2 years to be exact. Two years ago, on February 20, we found out that Reid's cancer had returned. The Facebook Memories feature is such a blessing and a curse to me. A lot of the posts are hard to see. But I love to look back and see the things that God has done in our lives. Two friends both texted me today to say that memories of Reid's surgery from two years ago had popped up on their Facebook Memories today. It means so much for people to remember with us the good works that God has done in Reid's life over the last two years. And yesterday another friend texted me a picture of her reminder on her phone that she is still praying for Reid monthly. The ways in which you remember my family blow me away! On February 20, 2014, we had traveled to Memphis with Reid in excruciating pain. He was on Morphine around the clock. Lance and I both KNEW that his tumor had returned, but you always hope against hope that there could possibly be good news. February 2014 was supposed to be his 1 year check up from finishing chemo the first time. Instead of being a time of celebrating, we were facing a time of grief like none I had known up until this point. The first time that Reid was diagnosed in July 2012, the prognosis was good. In February 2014, two doctors whom we had come to know and love and trust with our child's life, told us that Reid's chances of living were MAYBE 20%. How? How do you recover from these words? Two years ago today, after the LONGEST WEEKEND of waiting ever, Reid had surgery for the second time in his life to remove cancer from his body. The doctors had told us that for ANY chance of survival, the entire thing had to be removed. There could not be one trace of the tumor left in his body. After the surgery was over, the doctor and his nurse talked to Lance and me and told us that everything that he could see had been removed. They told us that an MRI would be scheduled for the next day to make sure that nothing had been left behind. We told the doctor and nurse of the prayer meeting that had been held at Istrouma to pray specifically for Reid and for Dr. Wilson. He choked back tears. You have to know this man to know how incredible this was. His nurse was moved to tears. And so the prayers of God's faithful friends in our life both near and far is the HOW we have recovered. A series of miracles took place from that day forward that are just too hard to put into words. Miraculously, about 2 weeks later, we found out that Reid had a completely different type of cancer than he had the first time. Words escaped all of us when we heard the news. But God knew. God knew that is how Reid's ultimate healing would take place. That even though when I heard that he would have chemo for 40 LONG marathon-like weeks, and I thought that I might die right then and there, this is how God was going to bring the healing. And then when I heard that Reid and I would have to live in Memphis for 6 weeks over the summer, and I thought, but HOW, I can't do this on my own! Once again, the prayers of God's people helped us all through the longest year of my life. And now, one year later, we have been told that he is CANCER FREE! And we have nothing but praise on our lips. We just can't believe what a MIRACLE we have received. And I want you to know that if you have ever met my child, you have met a living, breathing MIRACLE! He was never supposed to be born according to the doctors. (At least not without some kind of medical intervention....but he WAS!) Reid is going to be 7 on March 23! He came into the world big and strong! And he continues to be a miracle to this day! And we are so honored that God chose us to be his parents and to witness this miracle on earth! Yesterday, my memory from Facebook was the prayer meeting at Istrouma. So many of you gathered to pray for our son while we were 6 hours away. At the same time, some of you traveled to be with us in Memphis and sit with us during the surgery and pray and pray some more. So many of you brought us food, and mailed us gift cards, and mailed Reid gifts while we were in Memphis. And the thanks can never be enough! Thank you again and again for being the hands and feet of Jesus in our lives! And during these last two years, some of our St. Jude friends have lost their precious children. And the WHY's never stop. And you wonder, how have we escaped the same fate? And you pray and never stop praying for God to spare your child. And your heart never stops breaking for the precious babies who die EVERY SINGLE DAY! This past Friday marked 30% completion of Reid's treatment protocol. The treatment for Rhabdomyosarcoma is 40 weeks. 40 VERY LONG WEEKS! We are on week 13 this week. We will travel to St. Jude on Thursday for 6 weeks. Reid and I will be there the whole time. Lance will be travelling back and forth. Wyatt will be here with my mother in law and my family. He will be travelling to Corpus Christi for one week to visit his good buddies that moved 2 years ago. He will come to Memphis at some point in July. His 13th birthday is in July, so I want him with me for his big teenage birthday! I can't believe that I will have a teenager! Reid will have scans on Friday, June 6. These scans are part of his protocol that he is on. Everyone has scans on Week 13 of this protocol. He is scheduled to start daily radiation on Monday, June 9. He will have radiation every day for 6 weeks. We will be living in the Grizzlies House for the first week at least. I am praying that we get to stay at Grizzlies House the whole stay. The guy that I made the reservation with told me that we might be there the whole time. I am praying that is the case and that we do not have to move to Ronald McDonald house. Because I will be by myself for some of the time, being at the Grizzlies House would be much easier for me. I have not posted much because there hasn't been much to post. Thankfully, Reid was able to finish out the school year with his class. He graduated from Pre-K, and this momma could not be prouder of all that he has learned this year. He has felt great 90% of the time. There have been a few days that he has been tired or just not feeling 100%. But most days he has felt good, and he has played with his friends a lot since school has been out. I dread these coming weeks so much. I am trying to stay positive and know that this is all part of the process to get to the finish line once again, but that doesn't make it any easier to get it done. I will miss Wyatt so much. I pray that he has a great summer despite our being apart. 2) For his counts to be 750 or above on Friday so that he can get his chemo done. 8) Reid has started displaying some neuropathy in his feet which is a side effect of one of the chemos he is on. He will have some breaks from it in the coming weeks. Please pray that these breaks from this chemo will undo the effects that we are seeing in his feet. Please pray that they simply go away and quickly. 9) For our son to be healed of this disgusting disease once and for all at the end of these weeks of treatments. That he will live to be an old man telling of God's glory to his children and grandchildren. I saw 2 rainbows last week 2 days in a row. Rainbows are so beautiful, and they signify God's promise to his children. I pray that this perfect gift from God, our second son, will exemplify the promise of God. The promise for good and not for evil. For a future and a hope. When we left St. Jude after Reid's surgery, our oncologist told us that they were still waiting on the pathology to come back on the tumor. He said that sometimes tumors "differentiate" themselves. Lance and I didn't give it much thought. When we traveled back to St. Jude the next week, we knew that Reid was going to have a PET scan and a head and neck CT to make sure there were no other hidden cancer cells. We also knew that he was going to get a port again and start his first chemo. What we didn't know was that he was going to get a COMPLETELY DIFFERENT diagnosis. Reid's original diagnosis was spindle cell sarcoma UNDIFFERENTIATED. Basically what it means is that the cells looked like spindle cells under the microscope, but it was not a SPECIFIC type of sarcoma. NOW it is a specific type of sarcoma. It is now embryonal rhabdomyosarcoma. 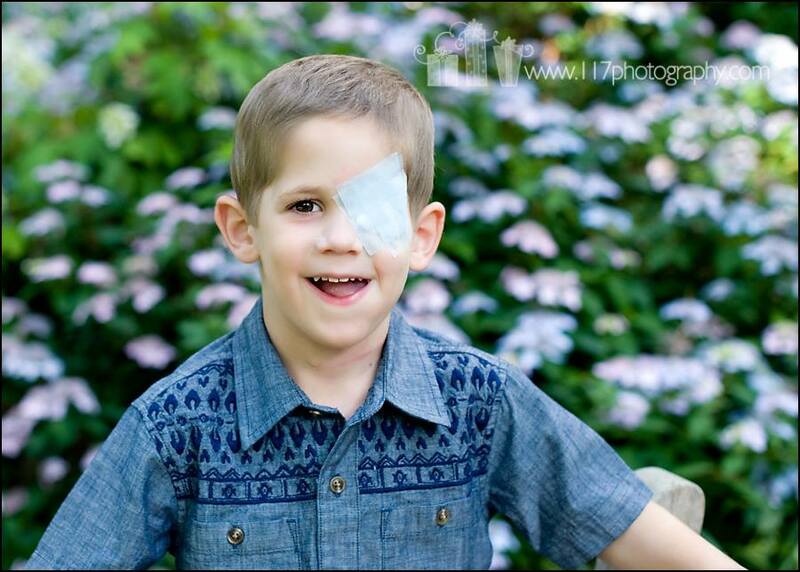 Every single one of Reid's scans came back completely clear, and we know the tumor was removed on February 24. We know that the MRI done 2 days later was clear. (Praise God!) So, now we do chemo and radiation again to kill any microscopic cells that may be left behind. Orbital rhabdomyosarcoma has a very high cure rate, but because this is a recurrence, no one is throwing out any kind of statistics. But that's okay because only God in Heaven above is the Great Physician. Only he knows the days that we are granted here on earth. We continue to cry out to God for complete healing for our son. 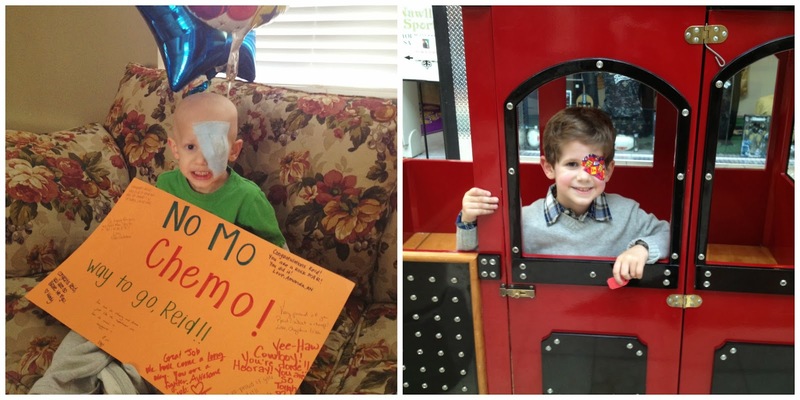 Reid had his first round of chemo at St. Jude on March 7. He handled it very well. He did not get sick at all. We were able to come back to Baton Rouge on Wednesday. We take Reid to the St. Jude affiliate clinic in Baton Rouge once a week for one medicine that takes about 5 minutes to administer through his port. They also will check his counts weekly to make sure he is doing well with all of his red blood counts, white blood counts and platelets. He will have 14 total rounds of chemo. They will be administered every 3 weeks. We will be at home in Baton Rouge for all of the chemo. Over the summer we will travel to St. Jude for radiation. We aren't sure how many weeks that will last. Radiation this time will be different. He will have it every weekday for up to 6 weeks. We are not sure of the duration at this point. His radiation oncologist is determining the duration based on the amount of radiation that he had last time. All of this news has been completely overwhelming to us. It is heartbreaking, devastating, exhausting and every other negative word that you can think of. Most of all it is unfair that a child would ever have to go through this twice. Please keep Reid in your prayers and pray for Lance and me as well. It is very difficult to watch your child be mad, sad, grumpy, and tired, and there is nothing that you can do to change it. My heart is broken into a thousand pieces again. Pray for Wyatt to be able to stay sane with two crazy parents. Pray that he knows how loved he is. We pray for total and complete healing on earth for Reid. God gave him to us 5 years ago this week. We are so thankful for the love and laughter that he has brought into our family. Please continually ask the Lord for his healing. Pray that the next several months will be as easy as possible for all of us. Way back a long time ago, the eye surgeon who performed Reid's tumor resection told us that if Reid ever had any pain in the area where he eye was removed, that could be an indication of tumor growing again. Reid's tumor grew REALLY fast, and it was very aggressive. Several doctors gathered us in a room back in 2012 to tell us that we had one shot to get this cancer. They told us that the cancer had a 90% cure rate with the surgery, chemo and radiation. Last Monday, February 10, Reid woke up and told me that his eye hurt. He was referring to the left eye that was removed, but we still all called it his eye. These words struck fear into my heart, but just as quickly as he said it, he went right on about his morning playing, getting ready for school and going to school for the day. He was fine the rest of the day and evening. Tuesday, February 11, he woke up with the same complaint. I had jury duty that day, so Lance was in charge of getting him ready and to school. He went to school and had a great day. He never complained about it again. Same thing on Wednesday, February 12 which also happened to be our anniversary. I was on the jury again, and Lance was in charge of Reid. When I finally go home at 5:00 on Wednesday night, I could tell that Lance was concerned. Reid had fallen asleep on the couch and woken up complaining of pain again. So, I emailed our St. Jude oncologist. I told him that Reid had been recovering from a very bad cold, but that Lance and I were worried because of what the eye surgeon had told us about pain in that area. He emailed back telling us that he thought it could be sinus issues causing the pain. Both Dr. Hatley (our oncologist) and Dr. Wilson (our eye surgeon) called Lance that night. I felt very reassured about it all after that. Our St. Jude oncologist wanted me to take Reid to the pediatrician on Thursday just to get checked out. Lo and behold, Reid had strep throat. So, I was glad thinking that it somehow was all intertwined. The weekend was long. It seemed like the pain was getting worse, but then on Sunday, Reid had a great afternoon. He played outside for a long time, and our friends even came over to hang out so that Reid could play with their boys. Monday started off bumpy again, but Reid seemed to perk up again mid afternoon. We even went to Walmart. Tuesday I took him back to the pediatrician because he seemed very lethargic and slept a lot of the day. She thought he was dehydrated, and she wanted us to bring him to the ER for fluids. So we did. We drove to Memphis yesterday afternoon. My boy who never shuts up talking did not say 2 words for the whole 6 hour trip. And he never smiled. He is the biggest smiler. So, our concern was growing as was Reid's pain. Today his MRI started at about 10:00. Last night Grizzles House was overbooked, so we spent the night in the Crown Plaza hotel which is just around the corner. After his MRI, we moved our stuff back to the Grizzlies House. We had a 1:45 appointment with Dr. Wilson, the eye surgeon. When you are in the cancer world, every single thing means something. One lady walked by and asked us to move to a bigger room, and I had a feeling something bad was coming. I saw a lady bug this morning, and I still had a feeling something bad was coming. I packed extra clothes for this trip. I usually never pack extra clothes.God has given me this weird "sense" about things. All week I keep getting glimpses of things that I thought were signs that something good was not coming. The biggest sign was Reid's pain level. It was/is very, very bad. He is on pain killers of the narcotic variety for the pain. So, they moved us to the bigger room (the same big room as 2012), and Dr. Wilson, Dr. Hatley and a few other people walked in. That's when you know for sure it's not good news. Reid's cancer is back. There really is no other way to put it. It came back in the same exact spot that it started. I asked the doctors what about they 90%? They explained how they came up with it, and what it all boils down to is that Reid's cancer is very rare and very aggressive. All that we know at this point is that he will be having surgery on Monday morning. Our biggest concern now is to get him out of pain. So, the surgery will alleviate the pain. Beyond that, we don't know. We have a meeting in the morning with the doctors again. The first round of this fight used all of the big chemos. Our oncologist is researching options. So many of you have asked me how I am able to put this posts on Facebook while we were going through this the first time. It's because you are all family to us. You all have prayed for us like crazy. You all love our son. And it is easier to write it out once so that everyone has the same information. We covet your prayers. We have no idea what the future holds. We just know that we have to get Reid out of this excruciating pain that he has been in. As we get more information, I will let you know. Thank you as always for loving us. And especially for loving Reid. One year ago, the last bit of chemo went into Reid's body. It was an exciting day, but it was a scary day also. We did not know what the future held, but we were so happy to be done with the excruciating 7 rounds of inpatient chemo. Sleeping in a hospital for 3 nights straight every 3 weeks does a lot to tax a body and mind. They say, "That which doesn't kill us makes us stronger", and that is very true. We are stronger in a lot of ways. But most importantly, we are still alive. I really thought that I would die at points. But when your child is in need of you to be strong emotionally and physically, you somehow find the strength to put one foot in front of the other. The last year has been emotional, exciting, and happy. Our trips to St. Jude have been emotional. (I doubt that will ever change) Reid's new beginnings in school and learning new things have been exciting. And the day to day life of getting back to normal have been so very happy. This is a chest CT where Reid is awake. He has an MRI each time as well that lasts for 1 1/2 hours. He is sedated for the MRI. On this day one year ago, the verse of the day on the Bible app was the following. "Bless the Lord , O my soul, And forget none of His benefits; Who pardons all your iniquities, Who heals all your diseases; Who redeems your life from the pit, Who crowns you with lovingkindness and compassion; Who satisfies your years with good things, So that your youth is renewed like the eagle." Psalm 103:2 This verse is a promise that I continue to cling to on a daily basis. We travel to St. Jude one month from today on February 20 for Reid's ONE YEAR post treatment scans. After that, his schedule will go from every 3 months to every 6 months. I can't tell you what a DRAMATIC difference that will make in our lives. We are so thankful! As always, we covet your prayers for our boy. Please pray LIFE for him! I pray all of the time one simple thing, "Please God, let Reid outlive me!" None of us are guaranteed tomorrow! We should all live with JOY in each and every day knowing that we are not promised another day on this earth! As always, we are so thankful for each and every one of you who has covered Reid in prayer! I'm so behind on updates on this blog. 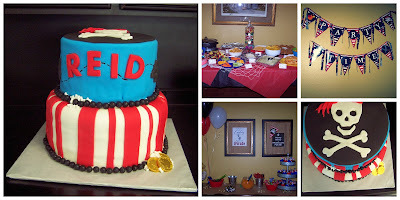 Reid's 4th birthday was March 23. He had his second surgery the middle of February, so in order for him to have more time to heal we postponed his party until the end of April. 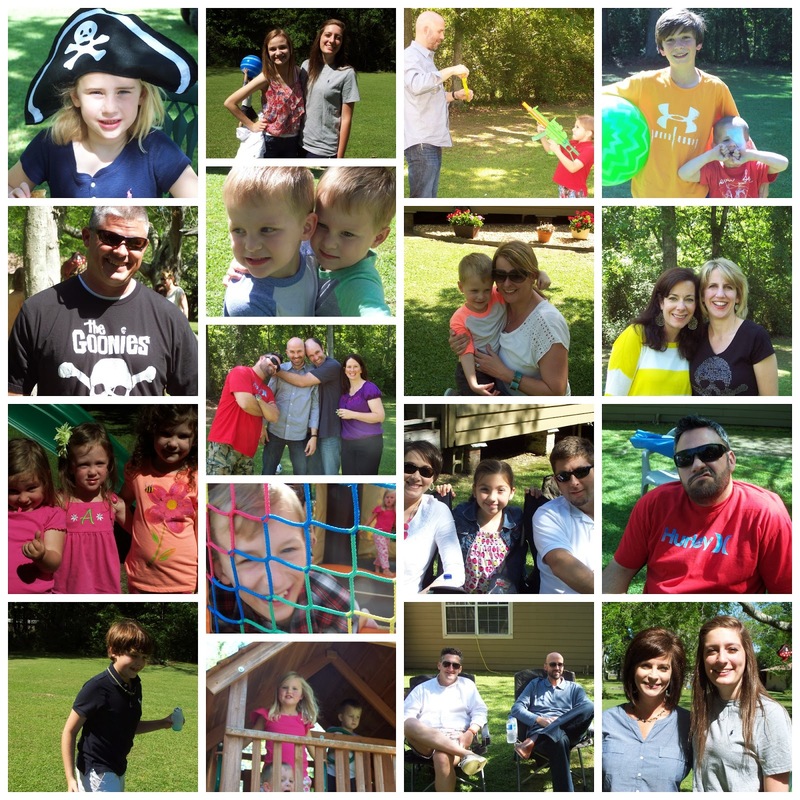 Every birthday is a celebration of life, but this party was truly a celebration! We celebrated walking through the unimaginable. We celebrated our baby's life! 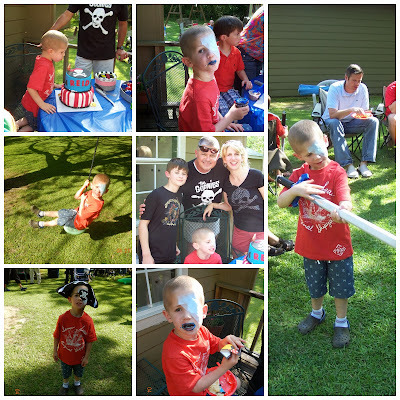 Even before Reid was diagnosed, I had already thought that a pirate birthday party would be so fun. Pinterest is FULL of ideas for pirate birthday parties. After our life took an unexpected turn, I still thought the pirate idea would be a good one for Reid's party. 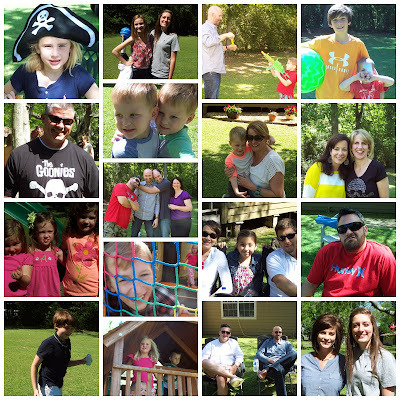 So many of our friends and family were there to help us celebrate. It was truly a beautiful and blessed day! One year ago today, my then 3 year old baby woke up. It was a Tuesday morning. We had (and still have) a morning ritual. He would get on the couch, I would cover him up with his blanket, and then I would fix his coffee milk. As I was tucking him under his blanket, I looked at him and said, "Your eye is swollen for some reason." It was so faintly swollen that no one, not even my husband, noticed. I think that later on in the day, when I told Lance, he thought that I had surely lost my mind. We went on about our day as planned. Wyatt was attending a camp all week from 8-5, so Reid and I were playing together all week. Tuesday we went to a friend's house to play with her 3 girls. She told me later on that she never noticed that his eye was swollen even a tad. Mother's intuition is definitely a TRUE thing! After we left my friend's house, we went to Chick fil A on Millerville. Reid LOVED to go to Chick fil A. Little did I know, it would be the last time he would be able to go to Chick fil A for a VERY long time. As a matter of fact, we still haven't been to one a year later. He played at Chick fil A for about 1 1/2 hours. I found a table right by the glass of the indoor play area, and he played to his little heart's content. I texted my friend and told her that we were STILL at Chick fil A after we had left her house 2 hours before. We both laughed at how I should bring him to play there more often! Throughout the day, I asked a few friends if their child had ever had a swollen eyelid. Some said yes, and all agreed it was likely an allergy. I started giving him Benadryl. The next day Reid and I went to the library. I had talked to a friend of mine who uses the same pediatrician as we do. We both agreed that I should call Dr. West the next day if his eye wasn't any better. Ironically, I saw my pediatrician at the library with her sons. She looked at Reid's eye and agreed that she thought it was an allergy. She told me to continue to give him Benadryl, and she said if he hadn't improved by the following Monday to bring him in for a visit. I said these very words, "I was just worried that it could be something serious." What in the world would make me say that? Once again, it was swollen so slightly that no one would notice it but me. My pediatrician said the worst thing it could possibly be was a cataract. So, we went on about our day having fun, but I couldn't shake the worry. Again, Lance thought I was crazy! The story continues that I brought him to see Dr. West on July 3. By then, Reid's eye was noticeably more swollen. Dr. West brought up the word tumor referring to a brain tumor. Wyatt was with us at the appointment. I scared him to death because I literally almost fainted. I had to lie down on the table to keep from fainting. Dr. West said that she was going to call an ophthalmologist to get us in that day. She wanted the eye doctor to look behind the eye to make sure that nothing was pressing on the optic nerve. Dr. West made the appointment for later that afternoon. I finally gained my composure enough to be able to drive. I immediately called Lance and told him to come home and meet me immediately. My mother in law came to pick Wyatt up, and Lance and I drove to Baton Rouge to the ophthalmologist's office. The eye doctor thoroughly examined Reid's eyes. His vision was 20/20 in both eyes, and she saw nothing concerning behind his eye. I breathed the HUGEST sigh of relief ever. She gave us some ointment to put in his eye and told us to come back in 3 weeks. Looking back now, I wonder how she missed it! I have no love loss for her. She saw Reid once again the day that we were admitted to OLOL. To say that I don't care for her is an understatement. As the next 2 weeks progressed, Reid's eye started swelling more and more. I spoke to my pediatrician on the phone after about 1 more week. We also had spoken to someone at OLOL, and we had an MRI scheduled for some time in July. After one more week of not being able to eat or sleep, I took Reid back to Dr. West on July 17. I had kept my friend's son that day so that he and Reid could play together. She knew the anguish that I was going through with worrying so much that something was wrong. When my friend came to pick up her son on that July 17 afternoon, I asked her what she thought. She could have sugar coated it and told me what I wanted to hear. But instead, she was honest with me, and she told me that she thought it looked like it was bulging. Those words caused me to get on the phone with Dr. West's office. It was no coincidence that Dr. West had a 2:30 appointment available. It was about 1:45 when I called. I called Lanced and told him to meet us there. Still at this point, Lance believed it was an infection or something minor. When Dr. West walked in, I saw on her face that she was very concerned. I have been using her since Wyatt was 2, and she has never had that look on her face. She did a few little exams of Reid's eyes, and she told Lance and me that she was calling OLOL to get us admitted so that we could have an MRI first thing the next morning. Well, the rest is history. The next morning, Reid had the MRI. A few hours later we met Dr. Emma Jones who is Reid's Baton Rouge oncologist. We love her. She has the best bedside manner of any doctor that I have ever met. She is a tiny thing, but she is so full of intelligence, wisdom and compassion. Sadly, she is moving to Boston. She is going to work with palliative care patients in Boston. She said that it is always something that she has wanted to do. Palliative care deals mostly with end of life patients as well as patients who have a major life change (such as amputation, etc.) I can't think of anyone better suited to work in this field than her. She helped us so tremendously through all of this last year. I will forever be grateful for Dr. Jones. On Thursday, July 26, we arrived in Memphis. This day will go down in history as one of the worst days of my life. Everyone was wearing their I HEART St. Jude shirts, and I just wanted to scream at the top of my lungs. I still don't want a shirt that says I HEART St. Jude. I love the work of St. Jude, but no place such as St. Jude should ever have to exist. But I DO love the life saving mission of the hospital. 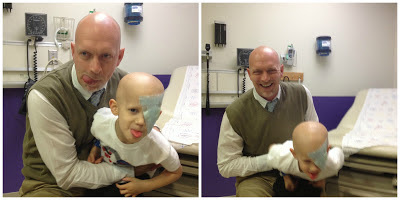 We met with Reid's Memphis oncologist on Thursday afternoon. Dr. Mark Hatley is a great doctor. He has a combined PhD and MD. He is so smart, but he is a very compassionate doctor as well. On Friday, July 27, we met the Radiation Oncologist, Dr. Krasin. I love Dr. Krasin! He loves the kids that he works with, and it shows. He has laughed with us and cried with us. He is an exceptional human being. Both of these doctors were so very optimistic for Reid. His original diagnosis was Rhabdomyosarcoma. Orbital rhabdo is very curable. My biggest worry at the time was that Reid's vision in his left eye would be compromised in some way. Little did I know what that afternoon would hold. Late in the afternoon, a nurse told us that Dr. Hatley, our oncologist wanted to see us again. He dropped the bomb on us that the diagnosis of rhabdomyosarcoma could not be confirmed under the microscope. Lance and I were dumbfounded. We weren't sure of what that meant. What Dr. Hatley didn't come out and say was that they were 100% sure that it WAS NOT rhabdo. The rest of the weekend we put on a happy face for Reid even though we were dying on the inside. We must have spent 12 of 24 hours of Saturday and Sunday on our phones googling what it could possibly be. We took Reid to the Memphis Zoo and the Children's Museum. I don't really know how we made it through the weekend. What we didn't realize was that the next 5 days would be the most excruciating days of waiting that we ever endured. And all the while, Reid's eye was worsening to a horrible extent while we waited. A full week later, on Friday, August 3, Dr. Hatley told us the horrific news that the diagnosis was Spindle Cell Sarcoma. And Reid's tumor was EXTREMELY aggressive. They categorize tumors in stages (his was Stage 2) as well as by how fast the cells are dividing, etc. Reid's was a grade 4+. This finding explained the drastic change in Reid's eye over the week we were waiting at St. Jude. He also told us the news that Reid's eye would have to be removed. I remember exactly what I was doing. I was looking at the floor, and I half way heard what he said. I looked up and said, "What?" I totally didn't get what he was saying. And I lived in a magical world of denial for the next 3 months! We were then told that we were being admitted for Reid to start chemo. Two things that we have learned about St. Jude is a) they don't waste a second of time waiting for anything b) things can change in a New York minute. We did not know that Reid would be starting chemo that Friday evening, but just that fast we went upstairs to the hospital room, and our baby was hooked up to an IV filled with poison to kill this monster. I have blocked out much of this week which brought me to my knees and put me flat on my back on many occasions. I lost a tremendous amount of weight from July to October of last year. I simply could not eat. I felt sick to my stomach at the sight of food. However, if you have seen me lately, you know that I have gained it all back:) LOL! We were in the hospital for Reid's first round of chemo until Tuesday, August 7. We packed up the car and drove him just in time for me to bring Wyatt to his open house at school. Wyatt started school his first day of 5th grade the very next day. At some point in the journey we met Dr. Wilson, the eye surgeon. His bedside manner is a little rusty, so we definitely started out on the wrong foot. Lance and I looked him up on U.S. News and World Report's Top 100 doctors list. He is listed as the top 1% of eye surgeons in the United States. If your child has to have such a horrendous surgery, it helps to have one of the top surgeons in the country perform the surgery. I don't have a pic of Dr. Wilson, but he works with a nurse practitioner named Tracy that we ALL love! She texts me out of the blue all of the time to tell me that she is thinking of us. She is a treasure! Seeing these pictures of Reid with no hair makes me so sad. To think about what we have walked through, we wonder how we made it. I say sometimes that I am still alive, and that is about all I can say. Lance and I are changed forever. Some in good ways, and some in bad ways. We have our house up for sale. Yesterday a couple came to look at our house for the second time. I have taken most of my pictures down because that's what HGTV says to do:) Anyway, yesterday I was thinking that people walk through our house and think these people are blessed...they have a beautiful home with beautiful kids. Both of those things are true, but these people have NO IDEA that we have walked through HELL for the last 12 months. Isn't that true of everyone? We look at people on the outside and judge them by the clothes they wear, the house they live in, and the car they drive. Yet we have no clue what is going in underneath all of that. May we show grace to everyone that we meet, because we have no idea what battles they are fighting. Our fight with Reid is far from over. We go back to St. Jude on August 14th for his next set of post treatment scans. Please begin praying again that our precious son's battle with this ferocious monster is over for good. Pray that he will live a long and healthy life from this point on. He is SO FULL of life. We just returned from Reid's Make a Wish trip. We went on a Disney Cruise. It was a fabulous five days of forgetting all of the bad that we have been through. Reid is so brave. He handles other children's questions with grace and strength. Lance and I were watching Wyatt and him in the hot tub on our last day on the cruise. A young girl asked Reid what happened to his eye. He never misses a beat. Our answer to all children is, "He had surgery". Most children can grasp that concept. It's easier than saying he had cancer. Most young children can't understand what that means. We asked Reid after the interaction with the little girl, "What did you tell the little girl that asked you about your eye?" We couldn't hear him when the actual interaction took place. He answered, "I told her I had surgery." Yes, you did sweet boy. You have been through more than any person should ever have to endure. And you faced it all with the bravery of a grown man. You never asked why, you never cried or complained (except when they were accessing your port), and you never acted sick. Your dad and I witnessed a miracle in you on the day that you were born. And we have witnessed a miracle in you every day over the last year. We are blessed to be your parents. You have taught us so much. We will never stop crying out to God for your life. We will never stop praying for you and all of the other children we have met who have fought their own battles very bravely as well. We will never stop praying for the families we have met who have lost their children. About 2 months ago, 3 children that we have met personally lost their battles. This fact is the hardest pill to swallow. Babies die at St. Jude every day. But they never stop trying to find answers and heal these precious children of this hideous disease. When we were at St. Jude for Reid's second surgery in February, I was standing at our door looking out into the halls of the hospital. I told Lance that the sights you see at St. Jude reminded me of a military hospital, except these children never signed up for this. Lance and I are participating in the St. Jude marathon in December. One of the moms that I have met on FB ran in it last year. She has a picture of herself on Facebook on race day. She wrote on her arm the words "my child never trained for cancer". Truer words have never been written. If I pass out trying to cross the finish line of the 1/2 marathon on December 7, I will have in my mind that any pain or fatigue that I feel is nothing in comparison to what my child has endured. And he did it all with no training and with no complaints. "More than that, I count all things to be loss in view of the surpassing value of knowing Christ Jesus my Lord, for whom I have suffered the loss of all things, and count them but rubbish so that I may gain Christ, and may be found in Him, not having a righteousness of my own derived from the Law, but that which is through faith in Christ, the righteousness which comes from God on the basis of faith, that I may know Him and the power of His resurrection and the fellowship of His sufferings, being conformed to His death; in order that I may attain to the resurrection from the dead. It's a Real Zoo around here!